Want to connect with Angelica? My business is "Jelly's Fur Baby Services". You can find me on Facebook or Google me. I am fairly new. I do mostly pet sitting, boarding, light grooming, pet taxi, house visits but for extended stays I will house sit, do general cleaning, water plants and collect mail. With pets, I post all of my adventures online. I have a Bachelor's Degree in Wildlife Conservation, Associates as a Vet Tech and know Pet CPR/first Aid. 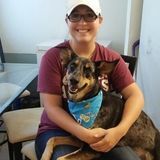 I can do injected and oral medications, vaccinations and would love to meet new human and fur baby friends! I am very good with big and small animals of all varieties, not just cats and dogs; I work with exotic, farm animal, birds and reptiles. I look forward to hearing from an interested party. Please call because that is the best way to reach me. I am a one woman working business!